For any wine lover, Mendoza, Argentina falls under destinations to visit for wine tasting. It is the capital of Malbec wine. They are the main grower and exporter of this delicious red wine. 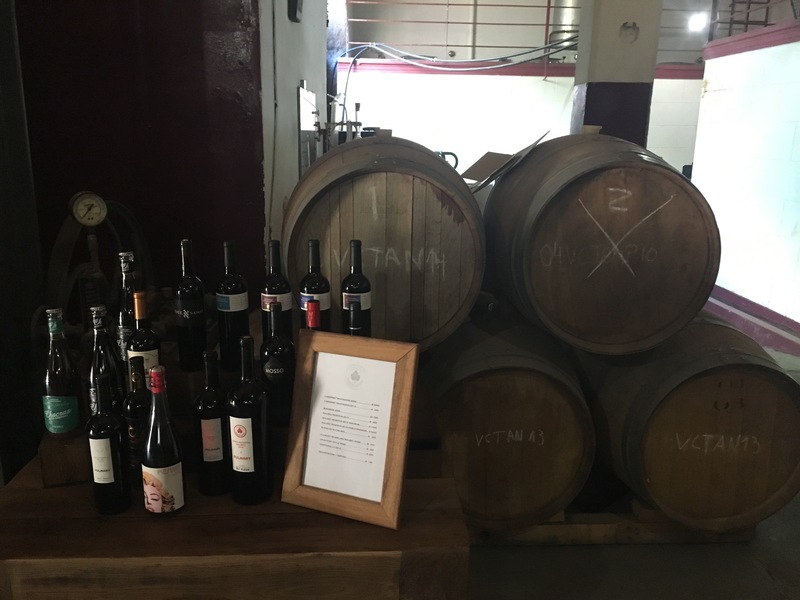 So, you would be remiss to not take a wine tour in Mendoza if you love Malbec. Once you finish wine tasting though, you’ll discover that this western province of Argentina has a lot to offer beyond just wine. We took the seven hour bus ride to Mendoza from Santiago, Chile. It was worth the long trek for all the scenery. You wind your way through the Andes mountains watching as the range creeps past your window. Its peaks are sprinkled with snow. Your ears pop as you go up in elevation. The bus actually climbs up the mountain along a switch back road rounding every corner tightly. The border crossing happens right at the top. We arrived in Mendoza city around dinner time. 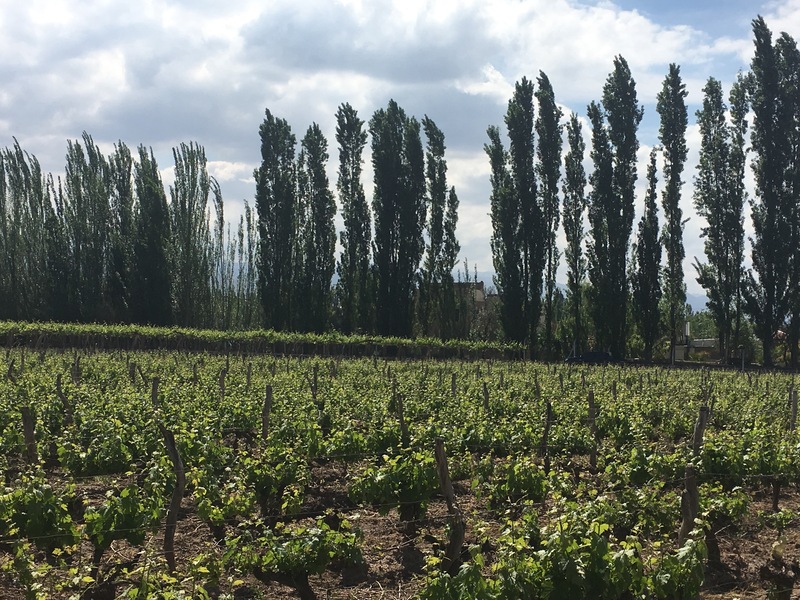 The city itself is nothing pretty, but the countryside around the province of Mendoza holds the real beauty of the wine country. There are several areas known for their green fields of rich grape vines: Maipu, Luján de Cayó, and Chacras. These are the main towns visited for wine tours. 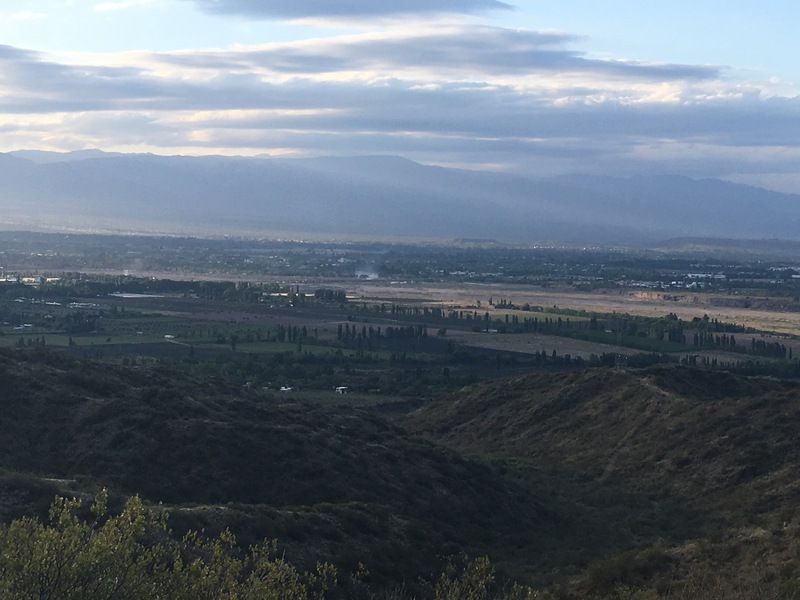 Instead of paying for an expensive wine tour in Maipu, where they shuttle tourists from winery to winery in one day, we chose to visit Chacras by bicycle. You can rent bicycles at Baccus Bikes for only 150 pesos ($9) for the day and they give you a map of four wineries that offer free or 100 peso ($6) tours and tastings. We rode the bus out of the city for 40 minutes to the small quaint town of Chacras. The locals helped us figure out where to get off. The small plaza at the center of town was bright white and full of locals. We found Baccus Bikes and picked up our comfortable bikes. The first winery, Pulmary, sat just around the corner. We ordered 12 empanadas across the street for delivery to eat with our wine. The lovely owner of the winery greeted us kindly in English and Spanish. A small black kitten with blue eyes named Stevie (Wonder), because he had sight problems, mewed from a basket nearby. We followed her through the mini cutout door in the metal wall. She brought us into the basement cellar full of dusty oak barrels and taught us about her process of making wine. The cement room held a constant refrigerator temperature naturally, making it perfect for storing wine. She led us through a dank cement hallway lined with barrels and into a small room with chalk graffiti all over the walls. 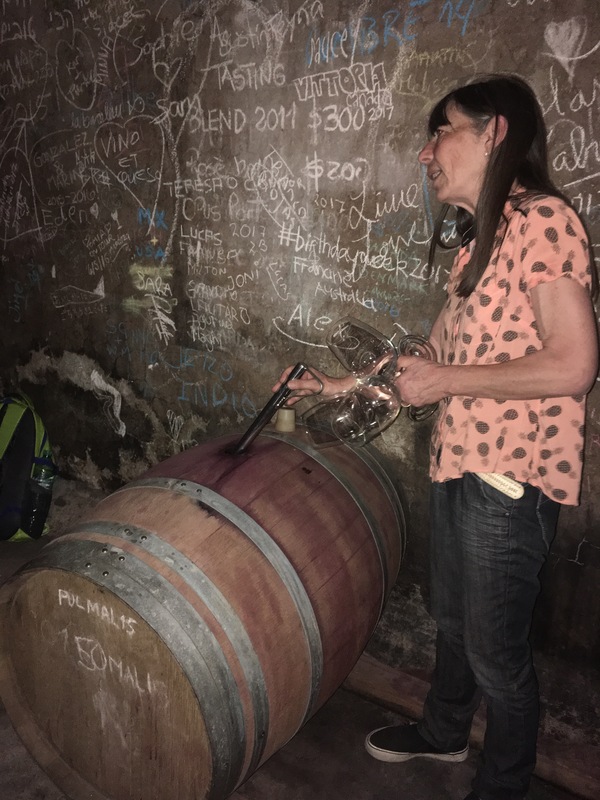 Then she opened a cork on one of the barrels and stuck a metal syringe into the hole and pulled up wine to pour into each of our wine glasses she was holding. She told us this was a 2015 Malbec that was waiting to be bottled. We each tasted the wine and it felt like it pulled all the moisture out of my tongue. Now that’s a dry wine. She explained the aging process and how she hides wine in the basement from her family so they will let it age and not drink it early. Her bell rang with our food delivery, so she led us back upstairs to enjoy our hot empanadas and a bottle of the 2015 Malbec on their garden terrace. The dry red washed down the hot meat and flaky bread well. We finished lunch and said our farewells. 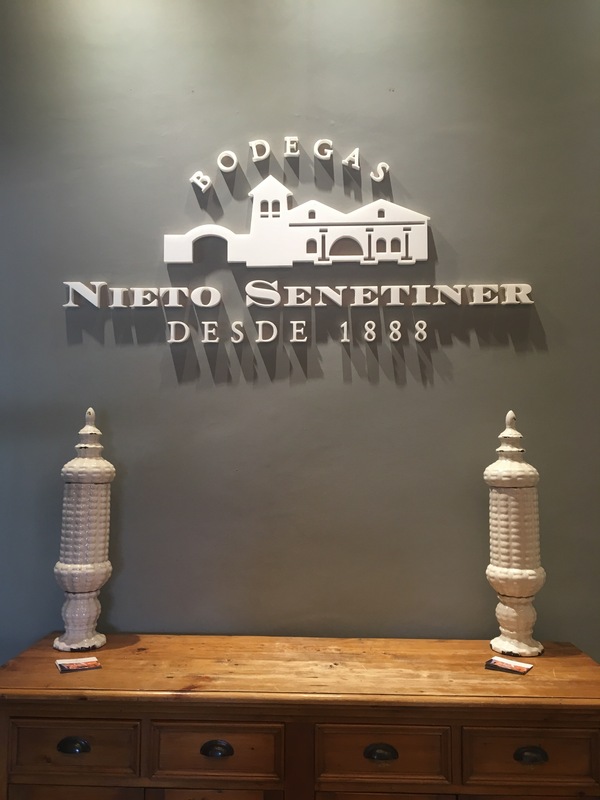 We visited two other locations: Nieto Senetiner and A la Antigua. Nieto Senetiner sat on a lovely property against the Andes mountains that painted their background. Their grapes date back to the first seed brought over by the Italian family in 1888. Their facilities were state of the art and their vineyards expansive and lined by Cyprus trees. The bilingual guide led us around the property, explaining their elaborate process, and then she taught us how to properly taste wine. There’s three steps to tasting: look, smell, and taste. We practiced all of these while tasting a Malbec Rose with a very transparent completion and fruit forward taste. Then we tasted a Cabernet Sauvignon with a bold color and full bodied taste. Finally the last wine was unique to only this winery and was called Bonarda. It was made with a different process and carried a very dry heavy taste. We loved the wines here and bought a regular Malbec and the Malbec Rose. 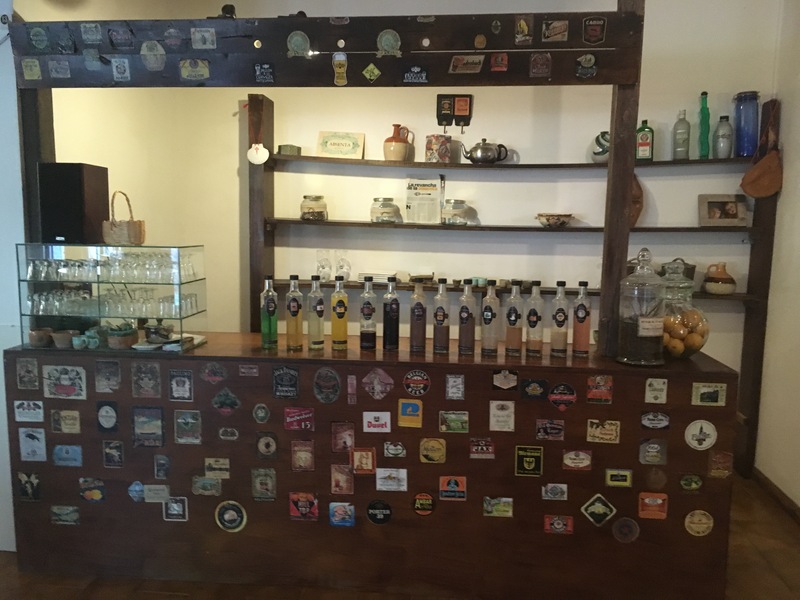 The last spot was not a winery, but offered free tastings of their spreads, jams, and liquors. A la Antigua is a small family-owned business in a house next to the local school. We had to ride down a gravel bouncy road to reach it. A young girl greeted us and we tried different tapenades, chutney, balsamic and other spreads on pieces of bread. Then came the sweets of pumpkin marmalade and dulce de leche with coconut and one with chocolate. They even had Cabernet wine reduction and Chardonnay reduction. Last we tried their liquors. 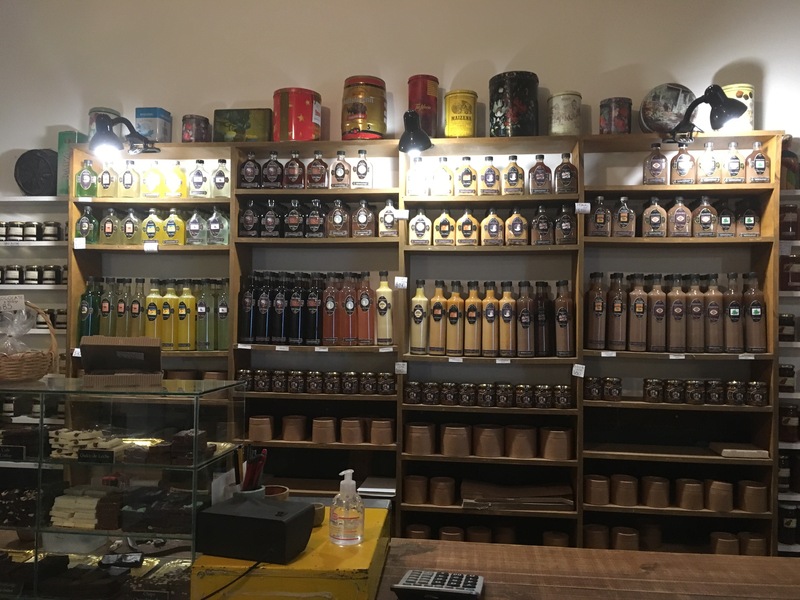 They made sweet chocolate and dulce de leche liquors and Irish cream. They also had an elixir named Hipocrates that the grandma of the family swore helped her ailments. She said one shot for a headache, two for the stomach, and three for the throat. They made absinthe and other harsher combinations too. We each tried one with a piece of chocolate, also homemade. And of course we didn’t leave empty handed. You can take other self-guided wine tours as well in Maipu and other areas. Beyond wine, the area has a lot to offer. 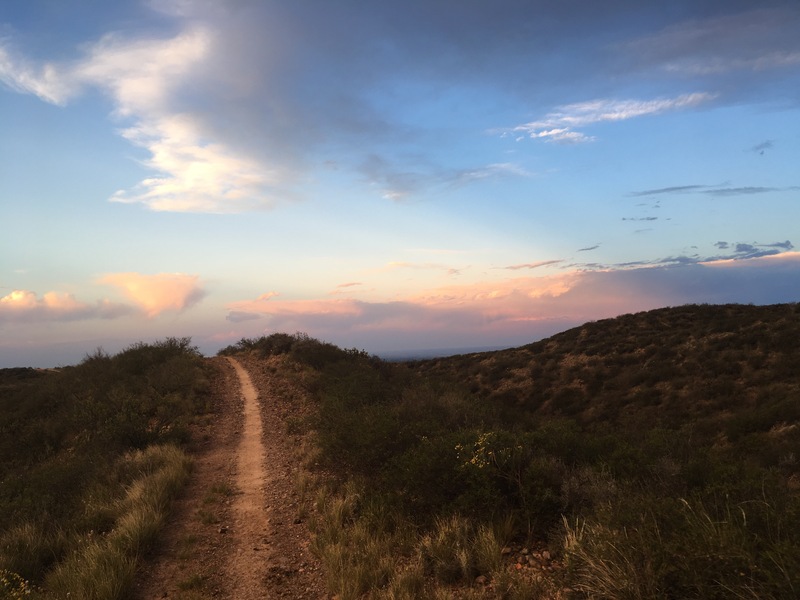 There are mountain hikes and trekking, 5-6 course meals, horseback riding, and hot springs. 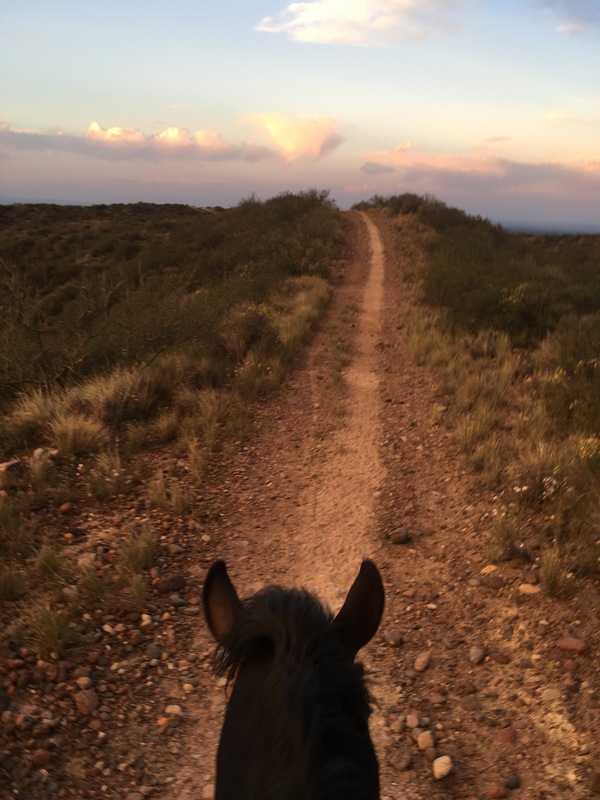 We chose to splurge on a sunset horseback riding trip in the hills around Lujan de Cuyo and visit the hot springs. The company Los Pingos offers the horseback trip. They pick you up at your hotel or hostel and drive you out to a beautiful vineyard in Lujan, 30 minutes from the city. Then their guide takes you riding in the desert hills around the area. There are spectacular views of all the vineyards and the backdrop of mountains in the distance. The hills are covered in cactus that had white flowers blooming during spring and lemon yellow bushes lighting up the hills. The horses know the well worn path and require very little directing. You can just sit back and enjoy the ride, while the sun shimmies behind the mountains leaving the clouds illuminated in red and orange. In every direction the sky glowed. Behind us the hills stood out green against the soft blue and purple hues painted across the sky. The crescent moon shone bright and guided us back to the vineyard as the sky darkened. When you return there’s a huge asado, BBQ, waiting for you. The chef prepares steak, sausages, and grilled veggies. You wash it all down with Malbec. This whole evening costs a whopping $67 and it’s worth every dime. The next morning as your muscles ache from horseback riding, you can visit the Termas Cacheuta hotspring resort. It takes 50 minutes by bus from Mendoza and you are transported to an oasis in the mountain valley. This place is both relaxing and exciting for the whole family. For just 150 pesos ($9), you can spend the whole day soaking in the cascading stone tubs with a view of the red mountains and river below. There’s hot thermal tubs at the top for the adults and fun cold pools with slides and a lazy river at the bottom for the kids or young at heart. We spent three hours here on a busy Friday afternoon switching from the hot pools to the cold. We even floated around the lazy river and went down the metal slide with the kids. It’s a fun excursion from town, but better visited early in the week when it’s less busy. (Sorry no pictures). 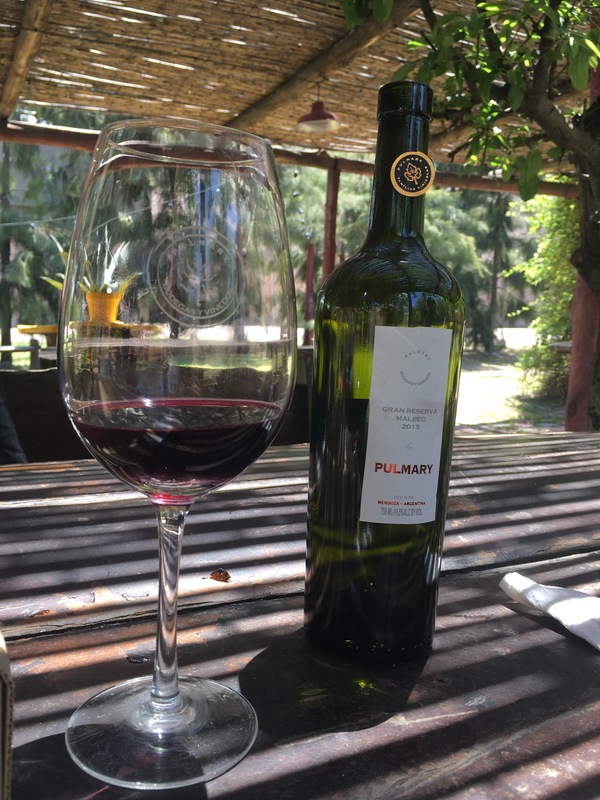 There is so much to do in Argentina’s wine province that you could stay a whole week and end each day with a big glass of Malbec. 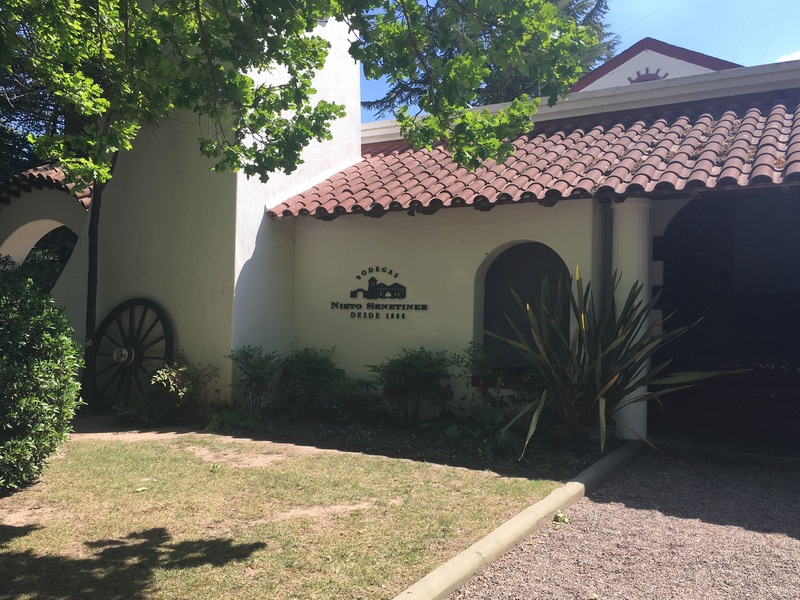 We enjoyed our four days wine touring, horseback riding, and soaking in the thermal tubs.